On the island of bougainville in the south pacific, his unit was hit by large artillery fire with no where to go. "he jumped into a barrel, with one leg and foot exposed. both were hit by gunfire." ​Glenn Wilcox was the son of Goldwin & Rose Wilcox. Here he is in a picture on the Wall of Honor at the Veterans Museum. He’s sweating -- He's probably in the South Pacific, where he was stationed. And he’s holding a Purple Heart. Here’s the story as recited in a booklet at the museum entitled, “World War II Veterans, Table Rock, Nebraska,” editor and date not stated. When Glenn joined the Navy, his division was a non-combat back-up unit for the fleet in the South Pacific. They moved from island to island and transported supplies by smaller craft to the fleet. Glenn was an Aviation Metalsmith First Class, busy with repairs on Navy and Marine Aircraft. Glen was first stationed on Guadalcanal and from there to several other small islands. The last island he was on was Bougainville, which is near the Equator. It is in the North Solomon Islands. It was jungled and mountainous. It was 50 miles wide and 500 miles long with a large volcano at one end. The volcano, 564 feet high, was undermined with tunnels and rooms which the entries camouflaged. Unbeknownst to Glenn’s supply division, the Japanese were holed up in the volcano. Their large guns (number 5 shells) could reach the area of the island where Glenn and rest of the crew were unloading supplies. Glenn reported: One day all hell broke loose.” The Japanese guns took them by surprise, injuring and killing the men. They did not have much cover because if you dug a foxhole it would immediately fill with water. Glen found two barrels welded together and jumped in head first. One leg and foot were exposed. Both were hit by gunfire. Glenn was crippled but able to help get others to safety. Their island aid station (or hospital) was only a low place in a swamp, covered with tarp. Although he wore the foot brace for almost a year he was still able to continue his duties. From Pearl Harbor, he was sent to Francisco where met up with his brothers Don and Ray as well as Walter Alderman from Table Rock, Nebraska. They were all returning from several months of combat on aircraft carriers. Glenn was given his first leave since joining as he did not have one after boot camp. He next was sent to Oklahoma for some training with rubberized equipment for the Navy. After a year and another leave, he returned to the Great Lakes Naval Station where he was discharged. The Japanese had surrendered. Glenn was on both Bougainville and Guadalcanal. Both are in the Solomon Islands, with Bouganville at the north and Guadalcanal at the south, about 400 miles apart. When he graduated from Table Rock, he could not possibly have dreamed that he would set foot on these two remote islands in the South Pacific. He could not possibly have dreamed that he would almost be killed on the faraway Island of Bouganville. In 1942, during World War II, Japan invaded the island, but allied forces launched the Bougainville campaign to regain control of the island in 1943. Despite heavy bombardments, the Japanese garrisons remained on the island until 1945. Following the war, the Territory of New Guinea, including Bougainville, returned to Australian control. 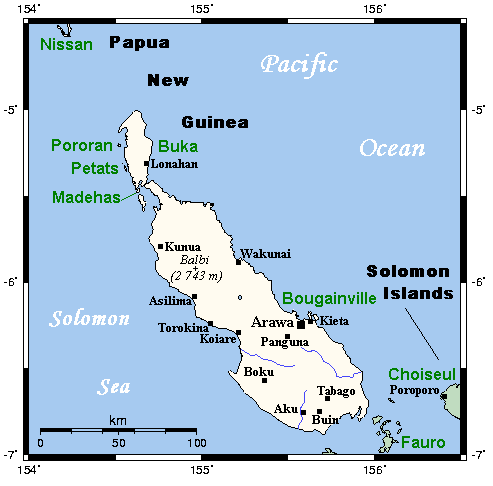 According to Wikipedia, in present times Bougainville Island is the main island of the Automonous Region of Bougainville of Papua New Guinea. 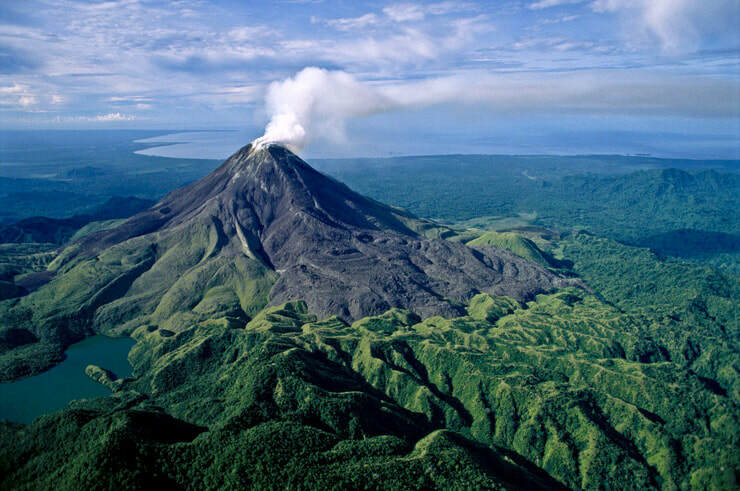 This region is also known as Bougainville Province or the North Solomons. Glenn was the grandson of Chauncey and Agnes Wilcox, pioneers in the Clear Creek Precinct in the western part of the County. Their son Goldwin was Glenn's dad, and Rose was his mom. Goldwin and Rose were married in 1917, a marriage that last until Rose's death 66 years later, in July of 1983. Goldwin attended Clear Country School and then Table Rock High School. After that, he went to Idaho to work, where he met Rose, who was from Iowa. His obituary says that he was a 'much respected and much loved" man. He was born in 1893 and died in September,1983. The children of Goldwin and Rose: Emma Wilcox Fisher (1918-2010), Raymond Wilcox (1919-1996), Glenn Wilcox (1921-2016), and Earl (1927-2016). Glenn was born in 1921. He graduated from Table Rock with the Clawass of 1939. While in the Navy, he was awarded the Purple Heart Medal, Asiatic Pacific Ribbon 1 Star, Good Conduct Medal, and the American Ribbon and Victory Medal. He married Betty Smith in 1946. He was a postal carrier for 30 years. He died 2016. Glenn and Betty's children: Beverly Marlow, Linda Lynch, Bryon Wilcox, Owen Wklcox, and Carol Otterberg. When Glenn died, there were 13 grandchildren, 21, great grandchildren, and 5 great great grandchildren. Glenn and Betty are buried at the Fairview Cemetery in Lincoln. Stop by sometime and contemplate the life of "Pegly Pete" and his family. That is an outstanding and such an interesting story. I do believe, that Col. Greg (Pappy) Boyington and his Black Sheep were very instrumental in the allies campaign to take over Bougainville in '43. These heroes had such guts and were so humble about it. I'm in awe of them. It turns out that Mark is correct. According to TaskAndPurpose.com's biography of Medal of Honor Winner Pappy Boyington, "On Oct. 17, 1943, in the skies over Papua New Guinea’s Bougainville Island, Boyington led a formation of 24 Vought F4U Corsairs over a Japanese airfield where 60 planes were grounded. The Black Sheep circled overhead, daring the enemy to come up and fight them, and in the ensuing battle, the Marine pilots downed 20 enemy aircraft. Not one of their own planes was shot down. By the war’s end, Boyington alone had destroyed 28 enemy planes." We don't know when Glenn was on the island. Since he said they did not know the Japanese were holed up in the volcano, maybe the incident when he was wounded occurred early in the American occupation of the island and maybe at a time when Pappy Boyington came to help in October 1943. We don't know. But it's fun to contemplate a Table Rock fellow in such a historical context!